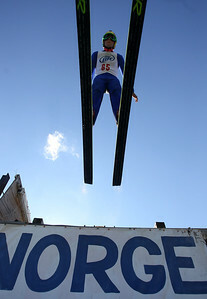 Individuals participated in Day 2 of the 27th Annual Norge Summer Ski Jump Tournament Sunday, September 30, 2012 in Fox River Grove. 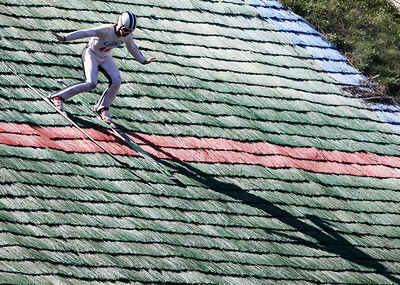 Mike Greene - mgreene@shawmedia.com Gabriella Armstrong, of the NYSEF Ski Club, flies off the jump while competing in the J1 Women Class during Day 2 of the 27th Annual Norge Summer Ski Jump Tournament Sunday, September 30, 2012 in Fox River Grove. 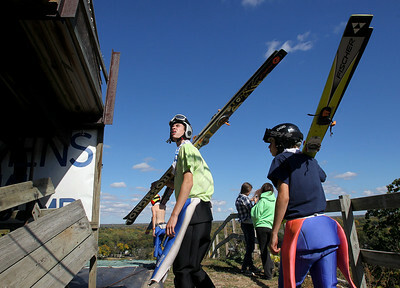 Mike Greene - mgreene@shawmedia.com Ryan Johnson, of the St. Paul Ski Club, takes off during a competition round in Day 2 of the 27th Annual Norge Summer Ski Jump Tournament Sunday, September 30, 2012 in Fox River Grove. Mike Greene - mgreene@shawmedia.com Patrick Gasienica, of the Norge Ski Club, prepares to launch from the platform while competing in the J1 Class during Day 2 of the 27th Annual Norge Summer Ski Jump Tournament Sunday, September 30, 2012 in Fox River Grove. 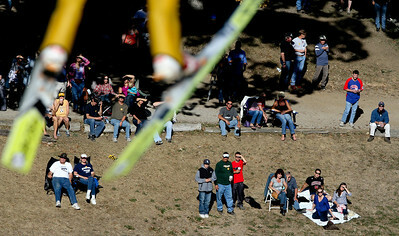 Mike Greene - mgreene@shawmedia.com Visitors watch as Ben Kaiser, of the Norge Ski Club, flies through the air while competing in the J1 Class during Day 2 of the 27th Annual Norge Summer Ski Jump Tournament Sunday, September 30, 2012 in Fox River Grove. Mike Greene - mgreene@shawmedia.com Michael Glasder, of Cary flies through the air during a competition round in Day 2 of the 27th Annual Norge Summer Ski Jump Tournament Sunday, September 30, 2012 in Fox River Grove. Mike Greene - mgreene@shawmedia.com Ben Loomis, of the Flying Eagles Ski Club, takes off during a competition round in Day 2 of the 27th Annual Norge Summer Ski Jump Tournament Sunday, September 30, 2012 in Fox River Grove. 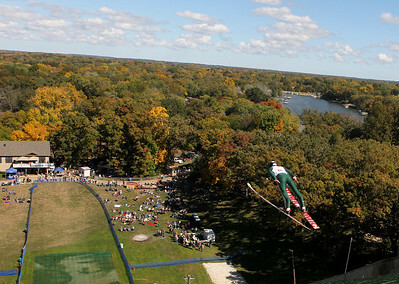 Mike Greene - mgreene@shawmedia.com Albert Gasienica, of the Norge Ski Club, flies through the air while competing in the Masters Class during Day 2 of the 27th Annual Norge Summer Ski Jump Tournament Sunday, September 30, 2012 in Fox River Grove. 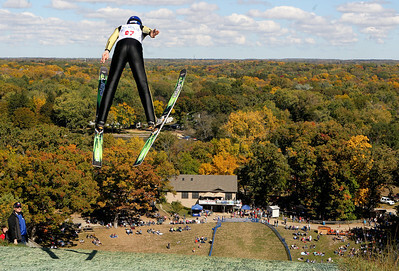 Mike Greene - mgreene@shawmedia.com Ben Kaiser, of the Norge Ski Club, flies through the air while competing in the J1 Class during Day 2 of the 27th Annual Norge Summer Ski Jump Tournament Sunday, September 30, 2012 in Fox River Grove. Mike Greene - mgreene@shawmedia.com Zak Hammill, of the Ishpeming Ski Club, lands while competing in the Masters Class during Day 2 of the 27th Annual Norge Summer Ski Jump Tournament Sunday, September 30, 2012 in Fox River Grove. 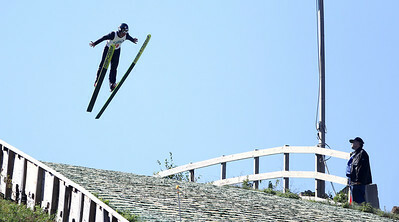 Mike Greene - mgreene@shawmedia.com Volodymr Hlyvka, of the Norge Ski Club, flies through the air while competing in the A Class during Day 2 of the 27th Annual Norge Summer Ski Jump Tournament Sunday, September 30, 2012 in Fox River Grove. Hlyvka won a cash prize during nonsanctioned competition following the days' events. 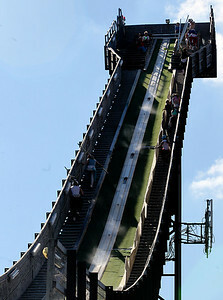 Mike Greene - mgreene@shawmedia.com Competitors make their way up the ski jump during Day 2 of the 27th Annual Norge Summer Ski Jump Tournament Sunday, September 30, 2012 in Fox River Grove. Mike Greene - mgreene@shawmedia.com Karl Schulz, of Lake Placid, NY, watches for competitors on the jump before climbing the stairs during Day 2 of the 27th Annual Norge Summer Ski Jump Tournament Sunday, September 30, 2012 in Fox River Grove. 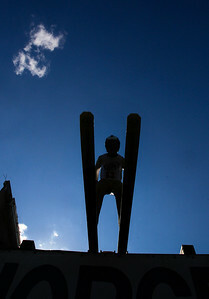 Ryan Johnson, of the St. Paul Ski Club, takes off during a competition round in Day 2 of the 27th Annual Norge Summer Ski Jump Tournament Sunday, September 30, 2012 in Fox River Grove.